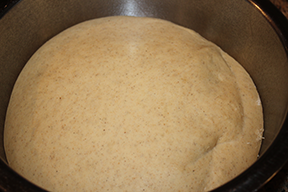 Lets start by making the dough. 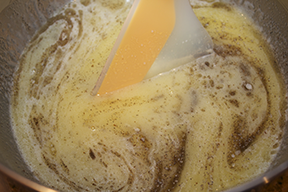 Preferable in a stand mixer, add the warm milk, sugar, melted butter, salt, yeast and cardamom. Let sit for 5 minutes to activate the yeast. Next lets add the flour and let the machine (or you) knead till you have a a smooth dough. Let rise in a warm spot covered with tea towel for 1 1/2 hours. 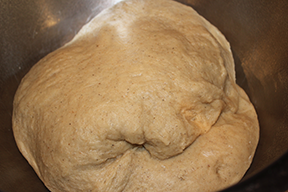 Next lets halve the risen dough to make it easier to work with. 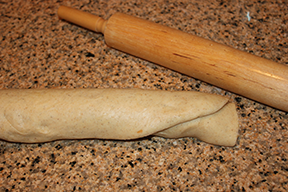 Roll each half out into a rectangle with the dough about 1/3” thick. 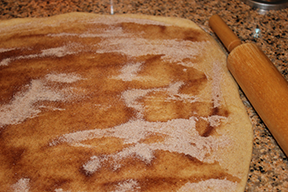 Brush the dough with half of the very soft butter and sprinkle with half of the sugar mixture. Now we want to roll the dough into a cylinder. Starting on the long sider, roll until you have a tight roll. Cut the cylinder in half and each half into 10 pieces. 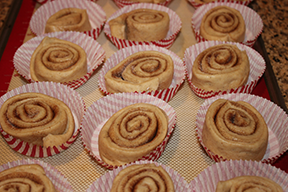 Place each piece into a cupcake form on cookie sheet for second rising. Again covered with a tea towel till doubled in size, approximately one hour. 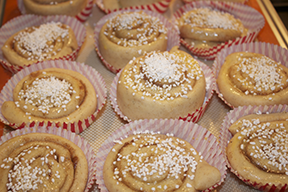 Before baking, brush the tops with an egg wash and sprinkle with the pearl sugar. Bake for approximately 9 minutes, let cool, and enjoy! 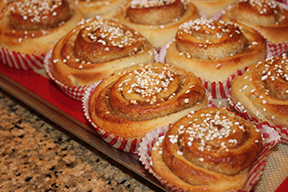 These Swedish cinnamon rolls look delicious! Your instructions look easy to follow. I can''t wait to try them. You must have an amazing Swedish Mother! These cinnamon rolls were to die for! I love how it melted it in my mouth and how it was a twist on the modern day cinnamon roll!